The chart below contains a comparison of the data as it was previously reported, and the data as it was revised and updated on Tuesday. The figures in the chart are annualized, as other economic data series like G.D.P. commonly are. They show the growth rate from the end of the prior quarter to the end of the current one — for instance, the increase in personal income from March 2012 (the last month in the first quarter of this year) to June (the last month in the second quarter). The most substantive revisions were to the data from the first quarter of 2012. 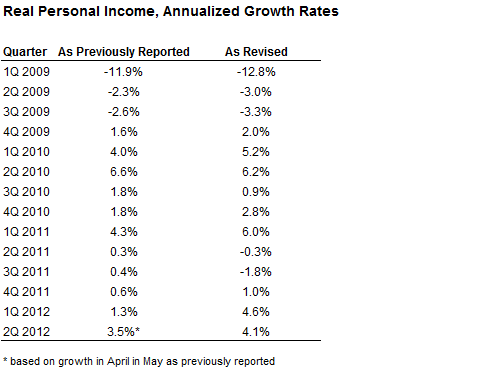 Income growth is now reported at 4.6 percent, as compared with 1.3 percent before. The growth rate in income was also fairly strong in the second quarter, according to the new data, increasing at an annualized rate of 4.1 percent. The revisions also had some effect on more distant quarters. Income growth is now reported as having declined in the second and third quarters of last year, for instance — although other past quarters, like the first quarter of 2011, were revised upward. Still, voters tend to focus on more recent economic news, so the fact that recent months have been revised upward is favorable on balance for Mr. Obama. Large revisions like these are common in the personal income data, which is a hard series to calculate because it requires many different sources of income to be added together. For some income components, reliable data is not available until months or even years after the fact. Moreover, the revisions have historically been upwardly biased, meaning that the data as initially reported tends to lowball the numbers — as seems to have been the case this time around. Our forecast model is calibrated based on the data as it was reported in real time in past election years, which makes these comparisons a bit more apples-to-apples. The new data is reasonably strongly correlated with Mr. Obama’s approval ratings — which dipped in the fall of last year (when personal income growth is now reported as having been negative) but recovered in the first few months of this year. Mr. Obama’s approval ratings have not lost much ground since then, despite other economic data series (including the jobs numbers) having been fairly weak. A coincidence? Possibly, or maybe even probably. No economic data series is a magic bullet, which is why our technique is to account for several different data series and average them together. Meanwhile, income growth over the whole of Mr. Obama’s term has still been fairly slow. Essentially, this measure was encouraging in 2010 and 2012, but quite poor in 2009 and 2011. Still, this data series at least now has an ambiguous interpretation for Mr. Obama — as opposed to the rather negative one that seemed compelling previously. Our forecast model still does give some weight to the poor numbers in late 2011 — and still reads them as a negative for Mr. Obama over all — but this is counterbalanced by the better numbers so far this year. Personal income is also one of the data series that economists use to date recessions, and so the fact that it has improved in recent months argues strongly against the idea that the economy is technically in recession right now. Some bearish economists had pointed toward the personal income data as suggesting that possibility; fairly often, recessions are not declared officially until three or six months after the economy is later determined to have been in one. The new personal income numbers imply, however, that growth has been unsteady, and for the most part slow — but that the economy is very probably not actually contracting. There is plenty of reason to be pessimistic about the economy, but proclamations made late last year by some economists that a double-dip recession was “imminent” now look to be incorrect. Incumbent presidents have typically gotten a lot of slack from voters, especially in the first term after their party took over the White House. There are some comparative bright spots in the economy — including the low rate of inflation, the relatively strong rate of growth in industrial activity, and a bullish stock market — along with some more dimly-lit areas. Where are the weakest links in the economy? The most conspicuous one is the data on consumer spending. Growth in personal consumption expenditures — another of the data series that our model uses — has been extremely sluggish, and it actually declined slightly from May to June. Consumption accounts for about 70 percent of the United States’ gross domestic product, which one reason that those numbers were slow, showing a 1.5 percent rate of G.D.P. growth in the second quarter. each of the past three months, based on the government’s latest numbers. The problematic numbers on consumer spending may reflect a lack of confidence from everyday Americans in the recovery. On Friday, we might have something of a tiebreaker between the more bullish and bearish figures. That’s when the government will report its initial estimates of the rate of job growth in July.